Today and Tonight: A cold front has pushed into the region from the northwest this morning, which will stall and linger through the majority of the day. 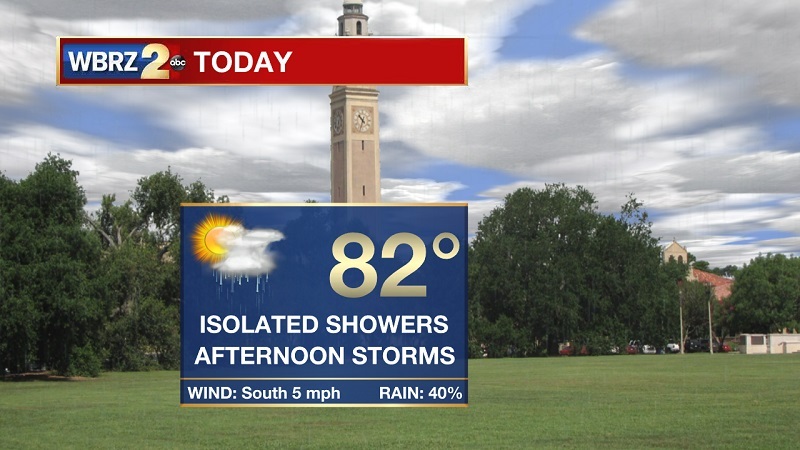 Showers will translate into isolated storms through the afternoon and into the early evening hours. Temperatures will be warming into the 70s around 10 AM, eventually reaching a high of 82°. Winds will stay light and out of the southeast into this evening. Showers and storms will push to our north by 7 PM, allowing for conditions to dry overnight and into Saturday morning. Clouds overhead will keep temperatures mild, only dropping to a low of 67°. Up Next: Strong to severe storms poised to move through our area over the weekend. No washout on Saturday or Sunday, but storms will increase in intensity after 6 PM on Saturday. Showers retreat east Sunday morning, staying dry and cool through Tuesday. Next batch of rain returns over the midweek. 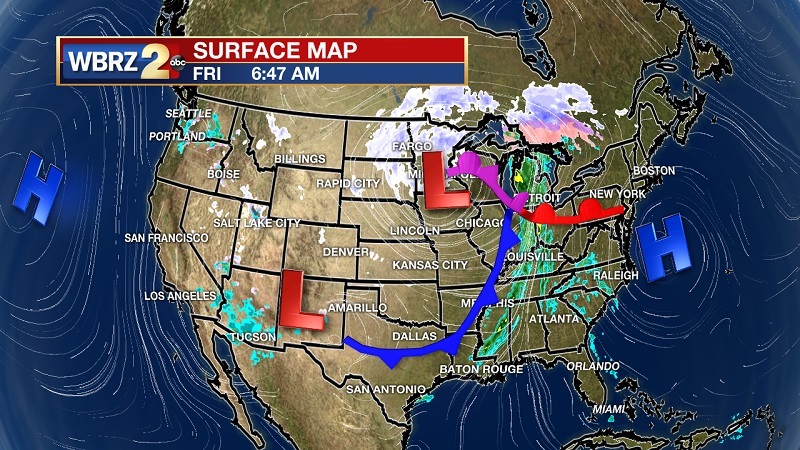 A strong system originating near the Great Lakes region is producing a cold front that is pressing into the Capital City this morning, and will stay stalled through much of the day. This will keep showers and isolated afternoon storms in the vicinity, before the front transitions to a warm front and pushes north by 7PM. Conditions will dry this evening and into the start of Saturday, but degrades through the afternoon hours. Significant instability and shear will allow for the development of strong to severe storms. 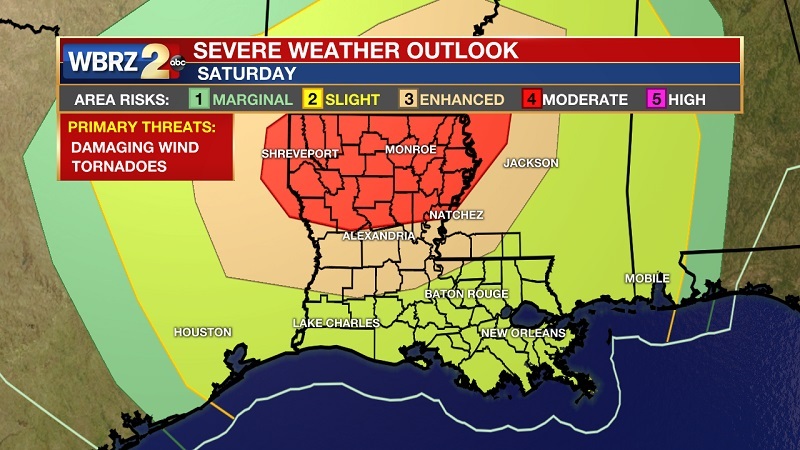 A tornado outbreak is possible to our northwest, as areas of Northern and Central Louisiana are in the moderate category for severe storms Saturday into Sunday – that’s 4 out of 5. Our viewing area is still in the slight and enhanced category, which was the same category we were in last Sunday when we experienced a confirmed EF-1 tornado near Sorrento. This threat will return during this event, as well as high winds and possibly large hail. Rainfall amounts will hover around an inch, with Storms depart to our east early Sunday morning, clearing skies quickly by noon. Temperatures will be much cooler to wrap up the weekend, as highs stay confined in the low 70s. 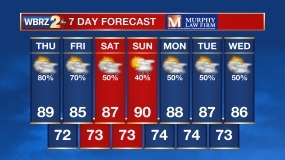 Sunny skies and warming temperatures will commence through the beginning of the workweek, but showers and storms return on Wednesday and Thursday.